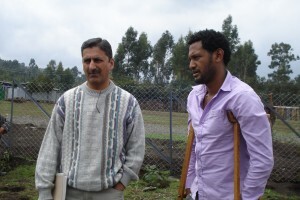 ISAPSO Project Coordinator Binyam Solomon (right) with CFTC’s Monitoring & Evaluation Manager, Faisal Islam visiting a project in Chancho, Ethiopia, June 2013. Faisal Islam, Ph.D., is CFTC’s Monitoring & Evaluation Manager. He sat down to help us understand more about the what, where, when, who and why of planning, monitoring and evaluation. CFTC: What is monitoring & evaluation? Faisal Islam: In international development and other social change, monitoring and evaluation (“M&E”), is a set of processes and tools used to measure the change we seek to make and the impact our activities are having in the communities in which we work. There’s an important additional component: planning, i.e., establishing the goals and outcomes that we want to achieve, determining the resources we’ll need, and identifying the indicators that we will use to measure our progress towards those goals over time. The whole cycle together–planning, monitoring, evaluating and then refining the plan–is what we call the performance management framework. CFTC: When is planning, monitoring & evaluation conducted? 3) the end-line, during which we explore what happened and revisit our assumptions in light of the evidence we’ve collected. Planning, monitoring and evaluating (PME) starts at the outset and it never stops. It keeps us in the healthy and productive loop of “what”; “so what”; and “now what” all the time. CFTC: Where is CFTC doing monitoring and evaluation? Faisal Islam: We have long done monitoring of service delivery in all of the countries where we operate. The evaluation aspect has increased in importance as the organization has transitioned away from its year-to-year activities base (a charitable model) towards becoming an agent of social change (a development model). Implementing the evaluation portion of the planning, monitoring and evaluation model happens after the outcomes and indicators are fully fleshed out during Theory of Change implementation. To date, Ethiopia is the furthest ahead; with Ghana next on the schedule. Faisal Islam: As part of my role, I will visit each country regularly to share learning and develop and monitor the PME action plan in consultation with our partners and country offices. My goal is to ensure that CFTC’s country staff and local partners are all aligned, motivated and trained to conduct planning, monitoring and evaluation regularly – at least quarterly in each community. CFTC: Why is it so important? Faisal Islam: Nowhere is the adage “You can’t manage what you can’t measure” more true than in development. Organizations with a charitable focus measure the delivery of services: how many meals were served? How many children received them? How many school uniforms were distributed? As we transition to becoming a social change agent, we are measuring impact: What effect do our efforts have on creating the change we wish to see? Social change is complex and it tends to happen slowly and in increments, so it’s critical that the methods used to measure it are precise but also flexible. You can only measure change if you know where you started (the baseline) and where you want to go (the outcomes). That’s where the measurement comes in. Measurement improves and speeds up decision-making. For example, if our desired outcome is to ensure families in our project communities can afford food for their children to eat healthy diets, we would first look at what strategies do we think are going to be most effective at increasing household income. Then, we would measure whether household income has, in fact, increased. Is that income being spent on food? Are families providing their children with three meals a day regularly? What are the intended or unintended consequences of our work? What do we need to do to ensure that families can afford food on an ongoing, sustainable basis? Once we start to measure our progress towards change, we can then invest in the strategies that are most likely to create that change. With regular measurement, feedback and learning, we can report our progress back to the communities where we work – making them stronger and more sustainable and empowering the beneficiaries of the programs. And most importantly, let our generous donors know where their contributions are being spent and what change they are part of creating.